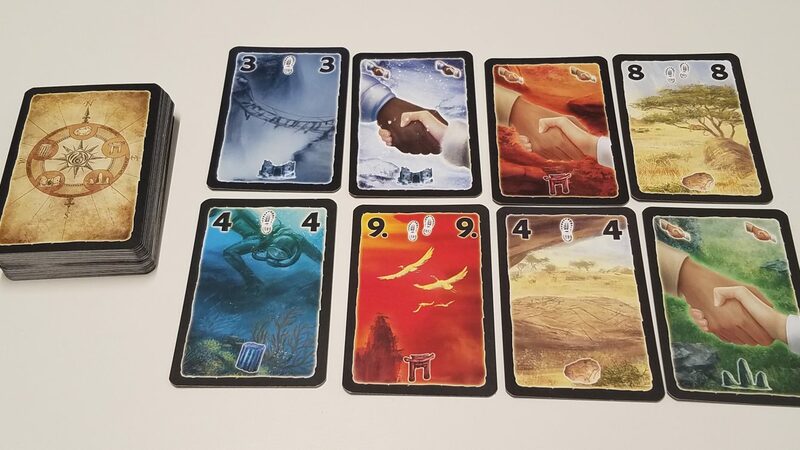 Lost Cities: Rivals retains the core gameplay of Lost Cities (making sets of sequential numbers) but adds a simple auction system as well as the ability to play up to 4. The changes made have the ironic effect of making Lost Cities: Rivals hum a bit better at the 3-4 player mark, when the bidding get more interesting. In Lost Cities: Rivals, you and your fellow expedition leaders will bravely blaze trails to exotic locales in search of lost artifacts and archaeological treasure, all the while managing your ever-dwindling budget and trying to out-do your rival explorers! 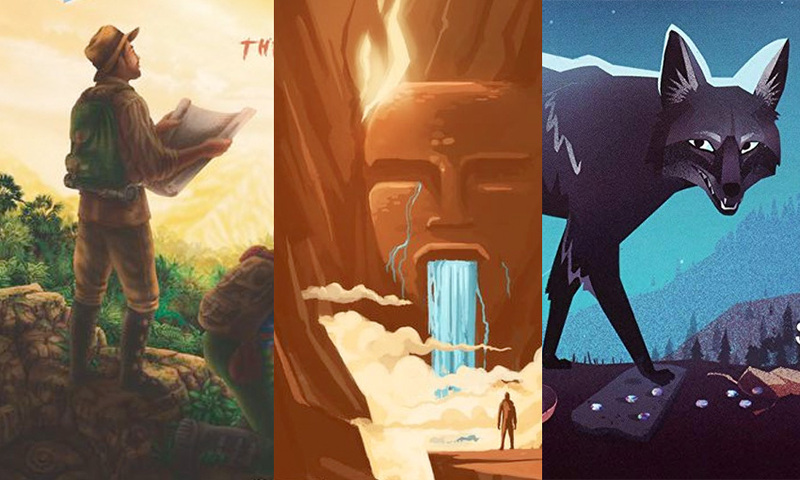 Jess: Of course, since Lost Cities: Rivals is based on Lost Cities (by the same publisher and designer), all that theme is just there to make the game look pretty – Lost Cities: Rivals is a set collection and hand management game, all the way down. Andrew: And don’t forget the bidding! 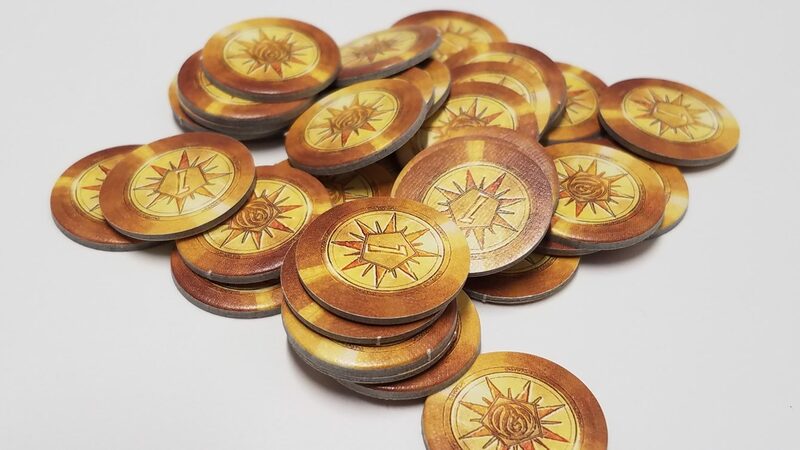 In Lost Cities: Rivals, you will begin your career as an expedition leader with a stack of coins and a couple of wager cards. 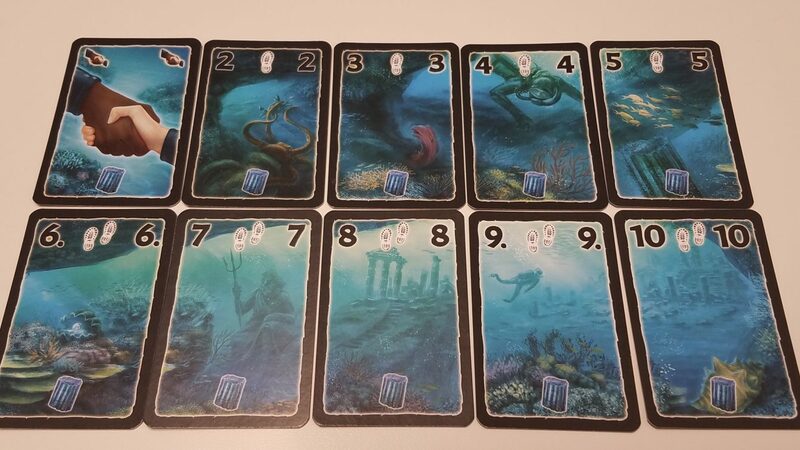 Each expedition is represented by the 5 suits of Expedition cards, which are numbered from 2 to 10 and can only be added to your personal sets in order (you’re free to skip numbers, but once a card is in a set, it stays there and you can’t place cards behind it). On your turn, you have a simple choice – either add a single face-up card to the Display, or start an auction for cards. Wager cards can form the anchor for your expeditions. Unlike the original Lost Cities, there’s zero drawback to using them! Drawing a card is simple enough – flop the top card of the Expedition deck into the communal Display face up for all to see. When you start an auction, though, that’s where things get interesting. Starting with the lead player, everyone bids how many coins they are willing to spend on gaining access to the cards in the display. The bidding goes around until all but one person have passed, and that person can then add as many cards as they want from the display into their own sets, in whatever order they wish. Once they are done adding, they may also select a single leftover card from the display to be removed from the game (to deprive an opponent the chance to claim), and then ends their turn by adding a single card to the display. 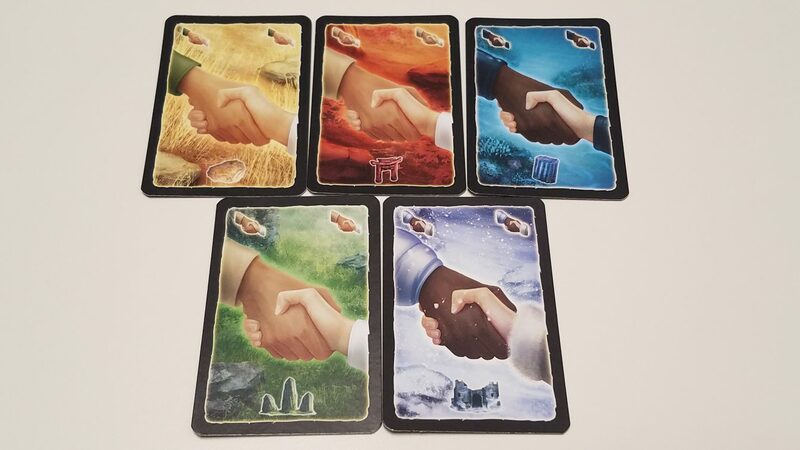 Jess: So, right off the bat, I do like the push your luck aspect of Lost Cities: Rivals. You’re always tempted to add cards to the display, because when you win an auction you can claim all the cards you want!…but of course, if you spend your turn adding cards, you’re not triggering an auction, and there’s always that risk/reward of how big you’re willing to let the pot get before everyone wants in and the cost of winning an auction gets too high! Andrew: Absolutely! And on the other hand, if you’re triggering an auction every time a single card you want for your sets shows up, your opponents will have a chance to bleed you dry of coins, making you unable to effectively participate in high-stakes auctions. As the game progresses, you will find yourself creating chains of cards, and at the end of the game, each player will count up the footprint icons they’ve amassed on their sets. If any of your sets started out with one (or two or three) wager cards, you’ll multiply that set’s footstep value, and whomever has the highest sum wins. Andrew: Lost Cities: Rivals is, at its core, a simple game. The tension really comes from the bidding, and choosing how many cards in a set you’re willing to skip. Jess: Skipping cards stinks, because those gaps in your sets can’t be filled, but sometimes it’s worth it to cut your losses and grab cards before your opponents can manage to get them. 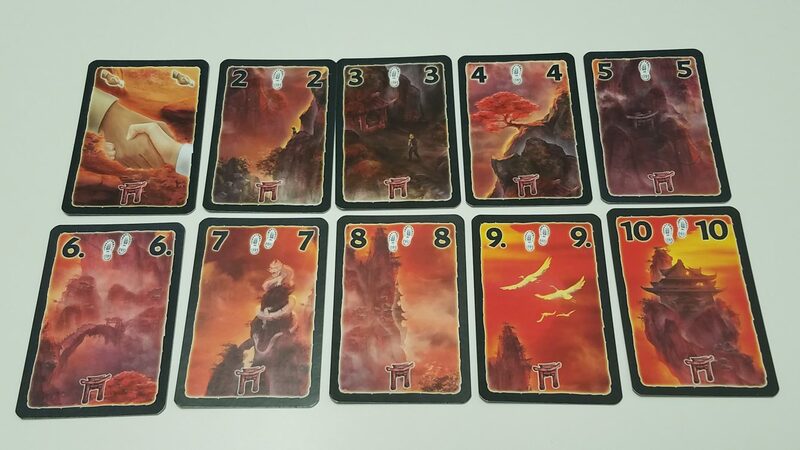 Now, as we mentioned, Lost Cities: Rivals is a successor to Lost Cities, a game for 2 which involves, you guessed it, creating sets of sequential cards in order to score points. The differences here is the introduction of the bidding concept, the ability to play more players, and the elimination of negative points (which you would end up having to manage if you didn’t build your sets successfully). Andrew: The irony is that the changes in Lost Cities: Rivals actually make it a game much more suited to the 3 and 4 player mark for us, which is funny given that its core mechanics are based on a 2 player only game. Jess: Absolutely yeah. I love not having to worry about negative points, but the auctions at 2 players just weren’t quite as exciting as they were with some more folks involved. Overall, I think the changes made to the core formula are really successful in making it a game for more than 2, but that’s where it’s best. Lost Cities: Rivals is a great game for game nights and for travel – its a small box abstract game that can be taught very easily and enjoyed by a small group quite quickly. While we liked it more with a higher player count (so it doesn’t quite replace Lost Cities in our 2 player collection), it was definitely a fun, engaging game and totally worth checking out! 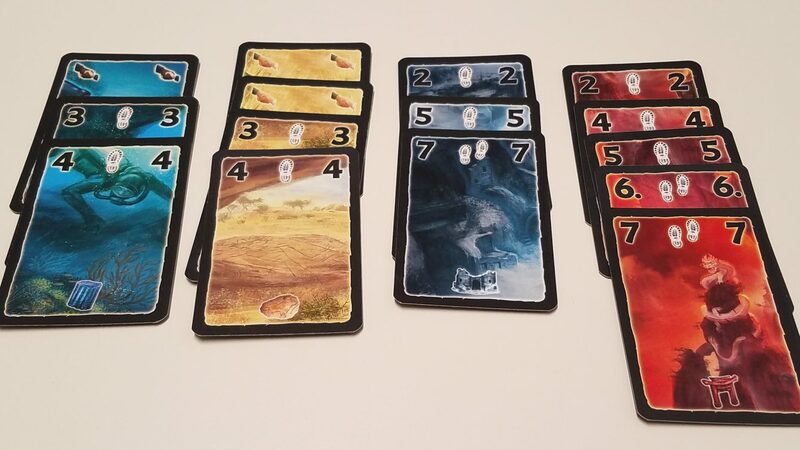 For the same experience, tuned to 2 players: Lost Cities – As we mentioned throughout, Lost Cities does what Lost Cities: Rivals does, but is a slightly thinkier, more satisfying game at 2 players…but it only plays 2 players. 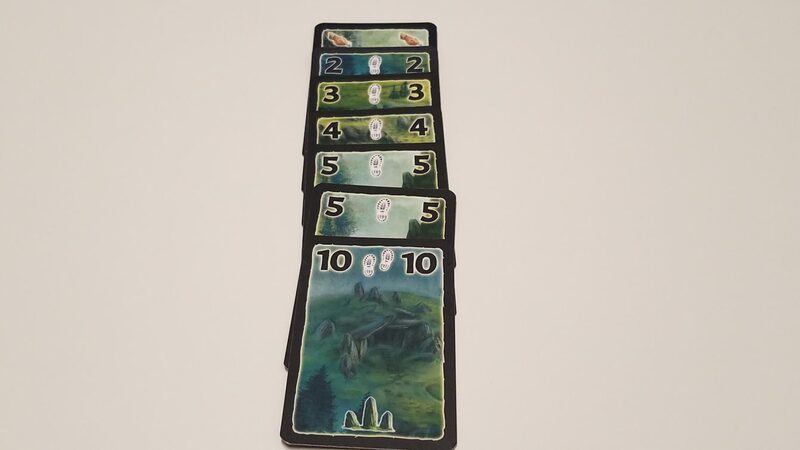 For another neat 2 Player Set Collection game: Spirits of the Wild – We did a Game in a Minute on this otherwise unknown (to us) little game, where we talked about how much we liked its artwork and design! For a game that feels more like actual archaeological expeditions: Artifacts Inc. – This gorgeous Red Raven game (which is practically a redundant phrase) uses dice and tableau building as mechanisms for players to become the most successful adventuring artifacts collector around!